In Scotland whisky dominates the story of smuggling, for the word has a dual meaning. To a Scot, 'smuggling' meant not just illegal import and export, but also illegal distilling. We are primarily concerned with coastal aspect of the free-trade, and the subject of illegal stilling has been dealt with thoroughly in other books. However, the excise officers charged with the responsibility of stamping out stilling were also concerned illegal imports, so it would be remiss to ignore the subject completely. 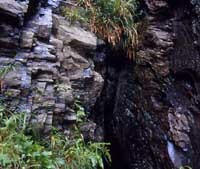 Most of the stilling went on in the glens, where there was a plentiful supply of the clean fresh water, needed for the soaking of the grain prior to malting. After several days soaking in a burn, the grain was spread out on a warm floor, and allowed to sprout. Roasting and grinding of the sprouted grain made the malt, which was mixed with hot water to create the wort. After fermentation, the wort was boiled in a copper container, and vapour condensed in a spiraling tube, called the worm, to make the spirit. As much of the stilling process as possible was carried out in the heather rather than on the hearth, and the stills were hidden in caves and hollows on the hillsides. Smoke curling up from the peat fires gave away the location of the stills, and it would be these plumes that the exciseman was seeking. Not all the illegal hooch was consumed locally: much of it was moved south of the border, often in very odd containers. 'Belly canteens' for the transport of spirits held two gallons and were made of sheet iron. They gave the female wearer a convincing if somewhat rigid appearance of advanced pregnancy. Another container was made to look like a passenger riding pillion behind the horse-borne smuggler — a leather head made the illusion complete. Smuggling in the sense of cross-coast trade certainly went on, but the business was on nothing like the same scale as in southern England. Poverty and the sparseness of the population accounts for this in part — with the exception of the principal towns, the market for costly foreign luxuries in Scotland was very restricted. Perhaps in response to these circumstances, the smugglers concentrated on the import of staple goods that were heavily taxed. Salt in particular was an essential for preserving meat and fish over the harsh dark winter months, and great quantities of salt entered the country principally from Ireland, via the west coast. Along with the salt, of course, came other forms of contraband, because import smugglers used Ireland as a warehouse and staging-post on their way from the continent, especially after control over the Isle of Man returned to the crown. Tea and tobacco came in this way, and were then transported to the Scottish cities on horseback: moving a box of tea or a bale of tobacco from Galloway to Edinburgh in the early 18th century cost 15s . The clan system, the powerful Scots church and Jacobean sympathies further united the population behind the smugglers, and made it unlikely that a free-trader would be found guilty in a jury trial. Even when the customs men managed to secure a conviction, the fines were paltry. 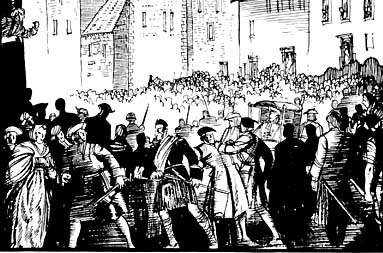 Antagonism between the revenue men and the Scottish population often turned to violence, and the most famous example is the Porteous riots in Edinburgh, which were triggered off by the execution of a smuggler in 1736. Wilson, the condemned man, had gained popularity when he helped a colleague escape from the Tolbooth gaol, and a mob gathered to jeer at the gallows. They insulted Captain John Porteous, the officer in charge of the guard, and pelted him with mud. The terrified Porteous fired into the crowd, resulting in several fatal injuries. Although he was sentenced to death for the shooting, there was a rumour that he would be pardoned, and a party, wearing disguise, broke into Edinburgh prison and lynched Porteous from a signpost. Prominent Edinburgh figures were implicated in this barbaric but highly popular murder, and as a result, Westminster imposed a £2000 fine on the city . After Union, the Scots customs and excise system was modelled on the prevailing English system, and abuses were imported along with the rest of the bureaucracy. 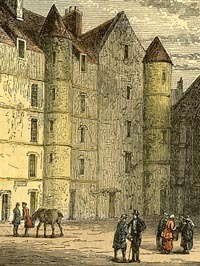 At Edinburgh, for example, customs officers at the city gates checked permits of goods arriving from the ports and did not hesitate to seize even the most mundane objects if they could be expected to make a few pennies from the sale. One zealous officer even seized a worn pair of gloves! . The methods used by Scottish smugglers were broadly similar to those in use elsewhere in the British Isles, with a few small variations. For example, to signal to ships at sea during the day smugglers sometimes stretched a bed sheet on the roof of a croft or a peat-stack, a practice that doesn't seem to have occurred elsewhere. The danger of chance discovery by routine patrols, while low in England, was virtually negligible in Scotland, so open, unopposed landings were the rule, and the tubmen or lingtow men on the beach would be interrupted only if an informer had named the time and place of the landing. Sinking of tubs was rare, possibly because it was unnecessary, or perhaps because surf crashing on the rocky Scottish coastline would soon destroy a raft of tubs.